The infrared and Raman spectra of L-Alanine were recorded and analyzed. The surface enhanced Raman scattering (SERS) spectrum was recorded in a silver substrate. The vibrational wavenumbers of the compound were computed using the Hartree-Fock and B3LYP levels of theory and compared with experimental values. The presence of methyl, carboxylic and amino group vibrations in the SERS spectrum reveal the interaction between the molecule and the silver surface. 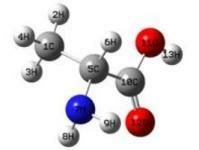 The calculated molecular geometry is compared with those of similar reported structures. The calculated infrared intensities and Raman activities are also reported.